I think that of all the views from our rooms, this has been my favorite. The Lauterbrunnen Valley is something that I didn't even know existed before we began planning for our trip. But now that we've been here, I think I could recommend it highly to anyone. In the shadow of these huge cliffs and waterfalls, it seems much easier to let issues and problems just kind of drift away in the beauty of this valley. Notice the horse outside of the barn in the lower right part of the image below. He's got a friend that we often saw with him, a small donkey. Sometimes we'd wake in the morning to the sound of chickens, but sometimes it was the donkey we'd hear. So, we left Stechelberg and wound our way out of the mountains and valleys of the Alps. We passed through many old cities and towns on our way to France. I've forgotten the name of the one in the picture below, but there was a narrow pass through which the road ran, and this castle was up on the hilltop overlooking that pass. I don't suppose we'll see many more of these in the coming months. For lunch today, we stopped near a shopping mall not too long after we passed into France. There were many options for us, including a Mexican restaurant called Nachos. But rather than go for the local cuisine, or a French flavor of the Mexican, we opted for good ol' KFC. Janice had talked about fried chicken a few days before, and once this restaurant was spotted, half a dozen of us went there. The chicken was good, but they didn't have mashed potatoes. The image below shows us in the courtyard of the hotel we stayed at in Beaune. The lady that runs the hotel (barely out of the photo on the right) is so thankful for what the Americans did for the French in World War II, that she wanted to give us a brief welcome to her city of Beaune (pronounced Bone). Our room is up 50 steps in a small winding circular staircase. The first third of the steps were stone, the last two thirds were wood. The architecture, the "bones" of the house, were clearly displayed for us in this room. 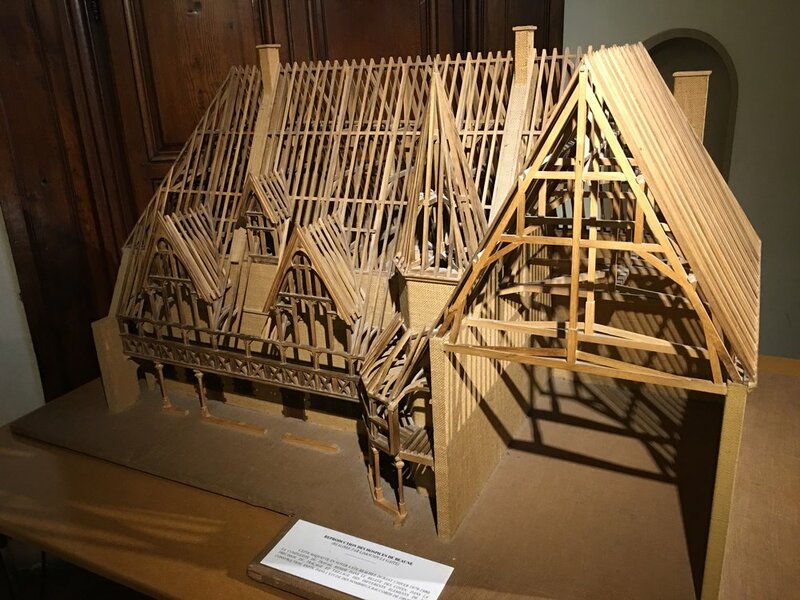 The Hospices de Beaune (or Hôtel-Dieu de Beaune) is now a museum, but was an almshouse setup by Nicholas Rolin in the 1440's to care for the sick and dying of the area. It has been beautifully preserved. The next five images show different views inside and outside of the hospital. Other than our evening meal, we didn't do much in Beaune as we arrived in the late afternoon and only stayed one night. For dinner, a group of us took our guides recommendation and ate at one of the restaurants near our hotel. Part of the meal was the appetizer. I had the escargot, and shared one with Janice. Kim (from our group) was with us there an also ordered them. I shared another of mine with her, even though she had her own order of six. Now that I can say that I've had escargot, I won't need to have them again. They weren't bad, as I was expecting. But I didn't like them so much that I'll be giving up burgers or tacos for them!